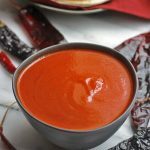 Red Chile Sauce AKA Enchilada Sauce-Quick Version. ready in 15 minutes or less. Just blend, cook and done. Rough chop the chipotle peppers and transfer to blender along with the next 9 ingredients, blend until smooth. Heat oil in small saucepan over medium heat, whisk in flour, cook 1 to 2 minutes. Pour blended mixture into a saucepan and whisk until smooth. Reduce heat and simmer 10 minutes until sauce thickens. Store sauce in an airtight container in the fridge until needed for up to 2 weeks. Sauce can also be bagged and stored in the freezer for 3 months.